Memphis Light, Gas and Water's "Gift of Comfort" helps those in need pay their utility bill. The program provides a means for individuals in the community to make a payment towards a customer's utility bill as a gift. Print out and complete the "Gift of Comfort" PDF file below. 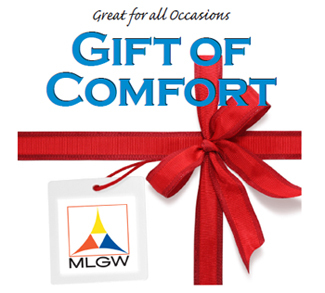 Attach a check or money order made payable to "MLGW Gift of Comfort" in the amount you wish to give. Your gift will appear in the form of a credit on the recipient's MLGW bill. Click here to download the Gift of Comfort form.